Note: If you cannot fix the problem after you follow these instructions, maybe we can help. Get help from RouterCheck Support. DNS is the process that turns website names into the internet addresses that lets your computer connect to websites. This process happens by means of a DNS Server which acts like an automatic 411 system behind the scenes. Things happen so quickly and seamlessly, you might not even know that they're working, but the health of the DNS system is critical to your web browsing experience. There are many DNS Servers running on the internet. Popular ones include Google DNS and OpenDNS, both of which are efficient and reliable. The one that you use is often configured in your router. If you don't set a DNS Server to use in your router, the one you use is often provided for you automatically by your ISP. When hackers compromise routers, they often modify the router's DNS settings so that they can control your DNS system. This is bad because they often configure your router to use a rogue DNS Server that they control. This allows them to misdirect your browsing whenever they like. 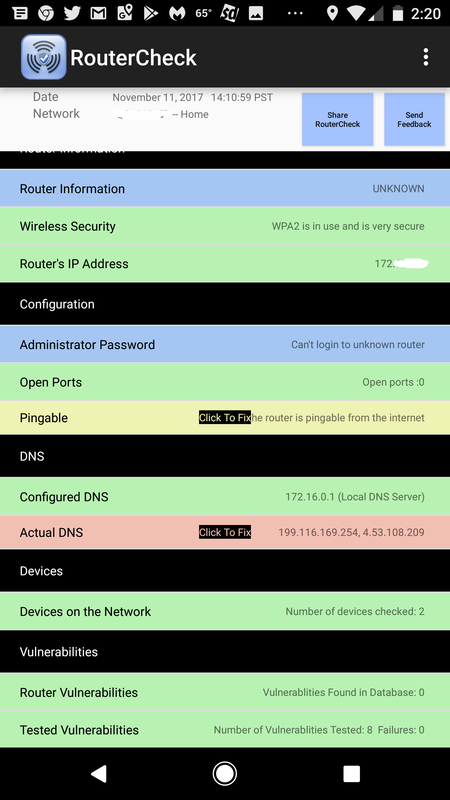 RouterCheck analyzes the router's DNS settings to help ensure that they aren't tampered with. When you configure your router to use a certain DNS Server, it's rare that that server actually handles your DNS requests. Instead, your requests are forwarded to another DNS Server that's controlled by the one you've configured. We call this server your "Actual DNS Server" and it's used so that there's more than one server processing incoming requests. If RouterCheck finds that people have reported issues with this server, we'd suggest that you configure your router to use a different DNS Server. Learn more about this problem with your router from RouterCheck. What is the risk of not fixing this problem? Using a hacker-controlled DNS Server puts every device on your network at risk. However, it's difficult to tell whether a DNS Server is really run by hackers, or is simply doing something it shouldn't. For more information, read the message associated with the problematic server. To be safe, we suggest that you configure a different DNS Server. You use a web browser to interact with your router and fix its configuration problems. However, before you can interact with your browser, you must log into it. RouterCheck can give you detailed instructions for logging in to your router. Step 2: If you log in successfully, your router's home page opens. Step 3: Navigate to the DNS Settings page. Navigate to this page by clicking the appropriate menu items and buttons. Step 4: If you are successful, your router's DNS Settings page opens. There are many publically-available DNS Servers that you may use for free. Popular choices invlude Google DNS and OpenDNS. Alternatively, speak with your ISP to learn how to configre your router to use their DNS Servers. On the page with the DNS Server settings, you should find several boxes where you can choose the DNS Servers that you'd like to use. It's advisable to use at least two servers, so that if there's a problem contacting the first, the second one may be used. Often, these are referred to as Primary and Secondary servers. Fill in the information that you have about the DNS Server that you've chosen. This will need to be done in the form of IP addresses, since a DNS Server would be necessary to resolve a regular website name. Now that you've fixed your problem, run RouterCheck again to verify that you have really fixed the problem. Get the default administrator password for your router. If you are still having difficulties, maybe we can help. Not really sure what your question is. Are you asking how to change DNS servers in Norton Core, or are you concerned about alleged DNS issues from over a year ago? I am not sure how RouterCheck vets DNS issue reports, so you would probably need to check with them about how concerned you should be. On the other hand, it looks like no problems have been reported in over a year. If this still bothers you, you can always change to a different DNS service, you don't have to use Norton's.